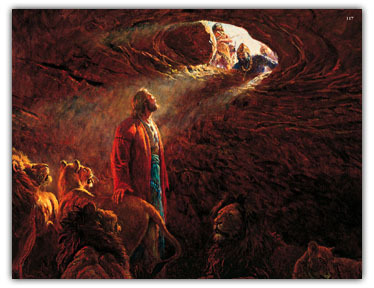 What You'll Need: scriptures, Four Parts of Prayer chart, Gospel Art Kit picture #117 - Daniel in the Lions’ Den, printed activities and coloring tools. You can also choose to download the PDF file of this lesson for easy printing. If you download, please leave a comment here on what you like about this lesson. Scripture: 2 Nephi 32:9 - "...ye must pray always, and not faint." If Mommy went on a long vacation and you couldn't see her for a long time would you miss her? How could you talk to her while she was gone? Before we came to earth we lived with our Heavenly Father. He sent us here to learn, grow and gain a body. He is our father and misses us. First, we open by calling our Heavenly Father by name. Second, we thank Heavenly Father for our many blessings. Third, we ask for any special blessings we or others may need at this time. Fourth, we close in the name of Jesus Christ and say Amen. This pattern is one we can use for the rest of our lives to address our Heavenly Father in prayer and is based on the way Jesus Christ taught us to pray in the scriptures. Sing or say the words to the second verse of “I Pray in Faith” (Children’s Songbook, p. 14) several times. 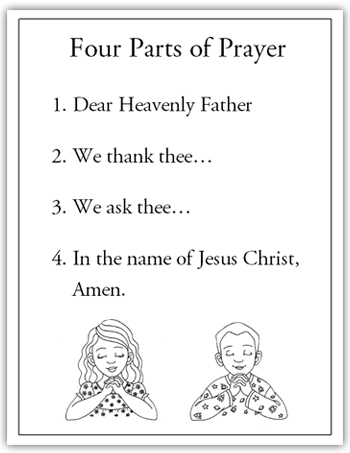 Have the children hold up one finger for each of the four special things we say when we pray. • How do we begin our prayers? • What could we thank Heavenly Father for? • What could we ask Heavenly Father for? • How do we end our prayers? Show Gospel Art Kit picture #117, Daniel in the Lions’ Den. Tell the story from Daniel 6. Read aloud the first part of verse 22 to explain why Daniel was not hurt while he was in the lions’ den. Explain that Daniel wanted to pray because it was a commandment from Heavenly Father and also because he wanted to thank Heavenly Father for his blessings. Bear your testimony about Tell of a time when Heavenly Father listened to your prayers. Share how thankful you are that we can pray to Heavenly Father, and assure them that Heavenly Father listens to us when we pray. This is the perfect lesson on prayer that our family needs this week! I just recently discovered this blog and I love it. Your lesson plans are great and appropriate for my two young daughters. I used your "Honoring your Parents" lesson #38 last week. I've got a post about that coming up on my blog on Tuesday, giving credit to you for a fabulous resource for FHE. Thanks for sharing all of your hard work, and I know I'll be back for more. I just recently discovered this blog and I love it. Your lesson plans are perfect for my 2 young girls. Last week I used "Honoring Your Parents" #38 and it went over well. I've got a post about it coming up on my blog this week on Tuesday, with a link to you and your fabulous resource for FHE. Thanks so much for sharing all of your hard work. I am going to use this lesson for fhe tonight. Thank you so much! Often times I just skip the lesson on Monday nights because I have no idea what to do. This site will really help my family learn more about the gospel and bond together. Thank you for all your efforts! Thank you!! I just found this blog today and I'm so excited! I'm going to teach the lesson you posted on Queen Esther. I'm so thrilled to have found this resource!! Great lesson and I love how you put a theme to each month and then build on that. I love your site and hope I can add to it. Love this blog! We sang the verse about Daniel from Follow the Prophet when we talked about Daniel in the Lions Den. We also had everyone in our family name something they can thank Heavenly Father for and a blessing they can ask for. My daughter loves mazes right now so that part was perfect! Thank you for this lesson! I will be using part of this with my primary activity. It's so nice that you have this blog. I love it. great lesson. my only suggestion would be to have a prayer lesson that talks about the importance of using proper words in prayers like thee, thine. Many adults in the church could use this reminder! I'm having problems when I download the "4 parts of prayer". The words don't show up. This lesson was perfect for my 2 and 3 year olds. Thank your for all your time and effort. You have really made doing FHE weekly, possible for a busy family! Thank you for sharing. It is a very cute lesson and adaptable for my young kiddos. Awesome!!! Great for my five year-old! thank you for this. i love how clear it makes teaching prayer to young children. These lessons are SO AWESOME! I had to have a password to download this one ... :(. I copied and pasted it instead, so I made it work. YAY! Love everything about this lesson and it has come at the perfect time! Thank you so much! 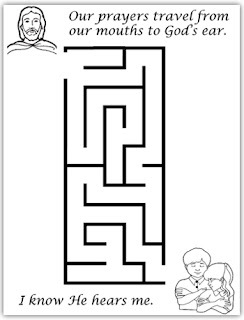 My son will especially love the maze. I LOVE that you include the activity pages. Downloading was a little difficult this time, did you switch where we download them from? I had to download a program (ilivid?) that I've never heard of, then I could download your documents. However, ilivid seems to have messed with my browser so that my start-up page is different. Did I really need to download ilivid or is there another way to get your fhe lessons? I've been working hard to have FHE with our little family, but as my children are still pretty young attention span can be a problem. Your FHE plans are helpful because they can be easily adapted to work with my small children, thank you so much! I LOVE LOVE LOVE this website. It's so nice to have help with FHE and to have it laid out a bit more simple. Thank you! Thank you so much for this lesson! My kids struggle with how to say prayers even though they have been taught so this is a great reminder. I am really excited to re-teach how to pray! Thank you for this great lesson. I look forward to sharing it with my family this family home evening!! Loved the lesson just having a really hard time trying to download the lesson with/from 4share. I don't know how to download it from there without having to become a member using my social media or paying for a membership fee. Does someone know how to download it? I am having difficutly downloading the whole image of the 4 parts of prayer. Is there anyway that you could maybe email me a pdf? Instead of the activity listed, we are going to make prayer rocks. I am new to your site and love it!! I am re-motivated to have weekly FHE with a house full of children. Your lessons are geared for all ages and as a single mom, I really appreciate that. Thank you for the great lessons. 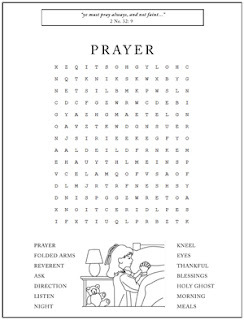 The extra coloring sheets, mazes, and word searches are also amazing. Thanks! I'm going to use this tomorrow night. It is simple and perfect. Thank you! Thank you so much! You do such a great job with these lessons! My kids really need this one with the breakdown on prayer. It will be perfect! Thanks! How do I download and print the pdf? It always takes me to this site that always directs me to spam pages. Brianna It should take you to a site called BOX Storage. That's where you can download it from. It should not be spammy. Is that where it's taking you? First of all thank you for your hard work and thank you for making this free. On this Prayer FHE I wanted to share an obstacle my family of children 3 years old to 8 years old have. Knowing what to say and not being repetitive. Does anyone else have this? Well something I included with this lesson is a diagram showing how prayers start with praying for ourselves and our immediate family and expands to friends and extended family and then expands to our community and then our country and then the world. This exercise has helped my kids think "outside the box". We also made a list of things to pray for, such as safety, strength, health, comfort, protection, guidance, and hearts to be softened. I hope this can help others too. We're trying to help our 2 yr old get the hang of this so this lesson is going to be perfect for this week! I hope you know how much you have blessed my family. I am a working mother of four and don't always have time to plan a lesson. It takes a lot of stress off of me to know that I can quickly print a lesson that my kids are going to love. I hope the Lord blesses you for what you have created!!! Thanks you so much!! Love the simple breakdown and the fun activity for younger kids. can download. takes be to a totally spammy download site, not the usual BOX one. :( Looks awesome Though! I have just downloaded this FHE for my family (four children ages 10, 8, 3 and 2) I love how you have an activity for older and younger children. Thank you so much. I love your lessons. We have used a few and I am trying to get this PDF to download, but it isn't working. Can you help? I don't know if I'm clicking on the wrong link to download the pdf but it always sends me to a place with no link and then just throws out spam.